Big things coming up 👆, Wizkid is tiring the web space with alot of innovations, from level to level. Ayo Balogun have have finally revealed the official lunch date of the starboy branded Jersey in collaboration with Nike. 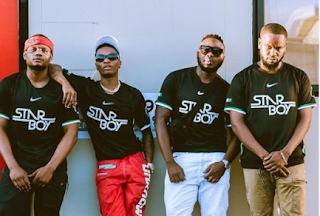 The jersey depicts the Nike swosh in front and the starboy brand name boldly spelt out in from too and still acknowledging that fact that yes he imarged from surulere Lagos Nigeria so it is quoted with green lining in the am.